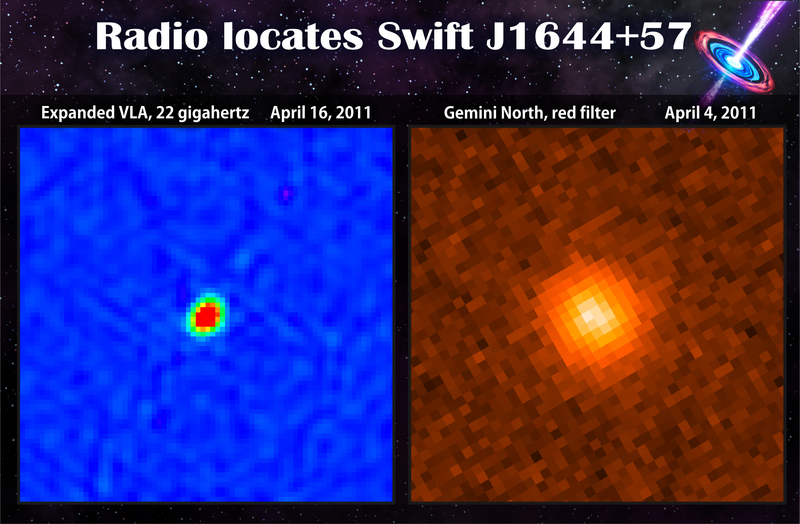 On March 28, 2011, the Swift space-based Gamma-ray observatory saw a strange event, which actually occurred about 3.9 billion years before: a star in a distant galaxy wandered too close to a supermassive black hole at the galaxy's center, and was swallowed by the black hole. This cosmic accident sent beams of high energy X-rays and lower-energy radio waves towards earth. This event was so powerful that the Swift observers initially thought the emission came from an enormously bright gamma-ray burst. However, unlike other gamma-ray bursts seen by Swift, this event did not rapidly fade away, but remained bright for more than three months. The only plausible explanation astronomers could come up with is the (rather leisurely) ingesting of a sun-like star by the galaxy's central supermassive black hole. Indeed, follow-up observations at radio wavelengths pinpointed the source of the emission to a region just about coincident with the galaxy's center. The image above is an artist conception of a star being swallowed by the black hole: the star gets distorted, then ripped apart by the intense gravity near the black hole. Most of the star will form an accretion disk around the black hole and will eventually pass through the event horizon, effectively leaving our Universe. Some of the material actually will form a jet which gets shot out into space. How often stars get swallowed by black holes, and what happens to any planetary systems orbiting the unlucky star, is anybody's guess. It's somewhat reassuring that the Sun is about 27,000 light years away from the Milky Way's supermassive black hole.